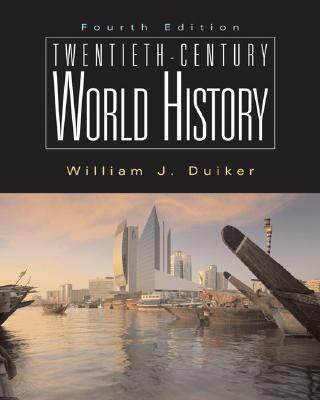 Duiker's comprehensive, balanced history of the world in the twentieth century provides you with context for interpreting the events that you hear about in the news each day. You'll view history from the broader global perspective, while at the same time gaining insight into the distinctive character of individual civilizations and regions. And to ensure that you'll have a well-rounded understanding of the most decisive moments in recent times, Duiker integrates political, economic, social, and cultural history into a smoothly written narrative. What's more, the text includes a special insert that guides you in using the text's many detailed maps, which help you make important connections between geography and the turn of historic events; timelines that highlight and contrast different cultures and nations, thus giving you an "at-a-glance," holistic perspective on eras and their defining events; photos from William Duiker's own collection that giving you a closer, more personal look at the world we live in; and primary-source documents that illustrate and clarify key points.Duiker, William J. is the author of 'Twentieth-Century World History ', published 2006 under ISBN 9780495095927 and ISBN 0495095923.